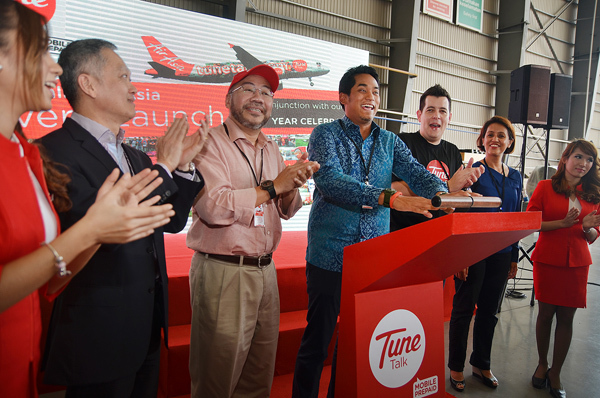 Tune Talk, the fastest growing mobile prepaid in Malaysia, today unveiled a specially-designed livery on an AirAsia Airbus A320 aircraft to kick start its Fifth Anniversary celebration. Tune Talk Sdn Bhd a mobile virtual network operator (MVNO) which is powered by The Celcom Axiata extensive network, will turn five in August 2014 and subscribers can look forward to a year-long celebration filled with exciting activities, campaigns, events and promotions. Minister of Youth and Sports Yang Berhormat Tuan Khairy Jamaluddin officially launched the aircraft livery at the Sepang Aircraft Engineering (SAE) hangar here today. Also present were the Co-Founder of Tune Group/ AirAsia Executive Chairman Datuk Kamarudin Meranun and Tune Talk CEO Jason Lo. In his speech Minister Khairy Jamaluddin commended Tune Talk for not only its various efforts and initiatives in connecting with the youth but also for its highly affordable rates, making it the preferred mobile prepaid service amongst youths. “When we first started in 2009, there were a lot of scepticism and many had bet that we wouldn’t last beyond two years and not possible for us to excel in this industry but with the hard work of our team at Tune Talk, we are where we are today standing proud to serve our subscribers with great services and products. We are coming out with better offerings this year and will continuously give our best to ensure that our subscribers have a seamless experience with us!” added Jason Lo. 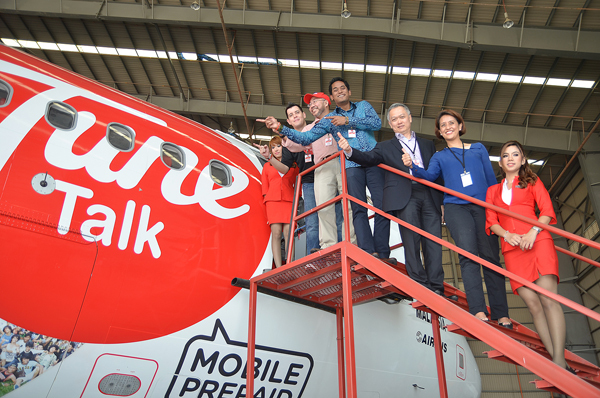 The Tune Talk Mobile Prepaid livery is painted on an Airbus A320 aircraft that has a capacity of 180 guests. Approximately 600 litres or 121 cans of paint was used by 20 workers to prepare this special aircraft livery over a duration of 12 days, and the aircraft will be plying routes served by AirAsia covering over 87 destinations across 20 countries, bringing the brand and experience to even more communities in Asean and the whole of Asia and beyond.